Many expected the 4 vs. 5 matchup in the Western Conference between the Houston Rockets at Utah Jazz to be one of the most competitive series of the first round. But James Harden and Co. have had other ideas. Houston completely dominated the first two games at home, then snuck past the Jazz in Game 3 on Saturday night to take a 3-0 series lead. 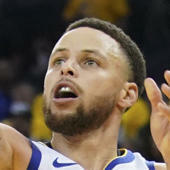 They'll now have a chance to sweep the series in Game 4 on Monday night, which would set up a rematch of last season's Western Conference finals -- assuming the Warriors take care of business against the Clippers.